Quick healer Iain Henderson returned to the Ulster side considerably earlier than expected after a thumb operation and turned in a man of the match performance against Leicester Tigers as the Irish Province won 14-13 to secure a place in the last eight of the European Champions Cup. Henderson, who last played in the back to back victories over Scarlets in December was not expected to return until March, but having been included in the Ireland team for the opening two rounds of the Six Nations Championship, he started for Ulster in the second row for their crunch Pool Four game against the Tigers and made his 100th cap a memorable one. Trailing 13-0 at the break, Ulster turned things around in the second half with tries from Marty Moore and Robert Baloucoune and two conversions from replacement scrumhalf John Cooney. The win secured a last eight place in the Champions Cup for the first time since 2014 with a probable tie away to Pool Four winners Racing 92. The French side were 43-33 winners over Scarlets in Paris. Henderson said: "Last season we went away to Wasps (in a similar scenario) and we did not perform and that did not sit well with the guys in the squad, so fair play to all the lads who have worked hard in the last few weeks through a difficult inter-pro period in the Guinness PRO14. We have come out, trained well and we got to see a bit of that on the pitch..
"Credit to Leicester in the first half they put us under some serious pressure and they went in at half time the better team, in my opinion, and we knew we had to come out and do something." 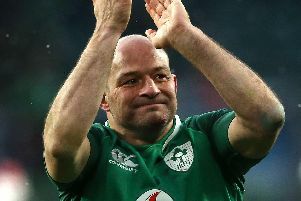 Twenty years ago Ulster lifted the Heineken Cup and captain Rory Best had previously said this current squad wanted to create their own legacy. Henderson said: "Many of the players playing now would have looked up to them, it is a bit of a generation difference. But those lads grew up with the great 1999 team and for them now to part of the 2019 team it is really special." As for his unexpected return Henderson replied: "It is good to be back!"